We offer reliable and high-performance electric hot water heaters that are simple and easy to use for offices and public facilities. Our water heaters help to create a functional and comfortable office space by facilitating the provision of a pleasant office system setting that will fulfill the role of a communication space from what was the humble office kitchen. The water heaters provided by our company can be readily adapted for use alongside other office essentials such as OA equipment, including computers, as well as desks, partitions and other office furniture. Water heaters are indispensable to ensure that hands are washed in order to kill bacteria and to provide clean water at preschools and nursery schools frequented by children as well as nursing homes and welfare centers where there is a large concentration of elderly citizens. The water heaters we provide are simple and easy to use, perfect for the elderly or busy nursery school teachers. One of the advantages of our company’s electric water heaters is their ability to provide constant hot water even when air pressure is low. This is because of their capacity to detect water evaporation. While similar devices able to detect temperature are available from our competitors, the sensors in these devices fail to accurately detect the temperature once the air pressure has dropped beyond a certain point, and stop short before the water has come to full boil. This phenomenon is something often mentioned to us in customer feedback. In contrast, the electric water heaters we provide our customers detect the evaporation of boiling water and as a result there is no impact on changes in the maximum boiling temperature. Our company’s electric water heaters are able to mix boiling water with regular-temperature water in phases, so that warm water at just the right temperature required for drinking or washing eating utensils can be supplied at the simple turn of a faucet. Of course, water at any temperature can also be provided by appropriately adjusting mixer faucets as needed. When using mixer faucets, please be sure to use water nets. Built-in microcomputer for no-fuss hot water supply. 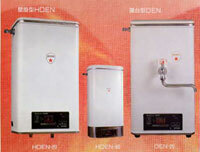 Mounted electric water heater Hi-Elecom-80B III. All our major electric water heaters deliver simple operation and multifunctionality, and not only provide users with hot water but come equipped with a Hi-Elecom-80B III control panel that can adapt to a range of usage environments. Copyright(C)2010 HOSOYAMA NEKKI Co.,LTD. All Rights Reserved.